What was the purpose of this object? 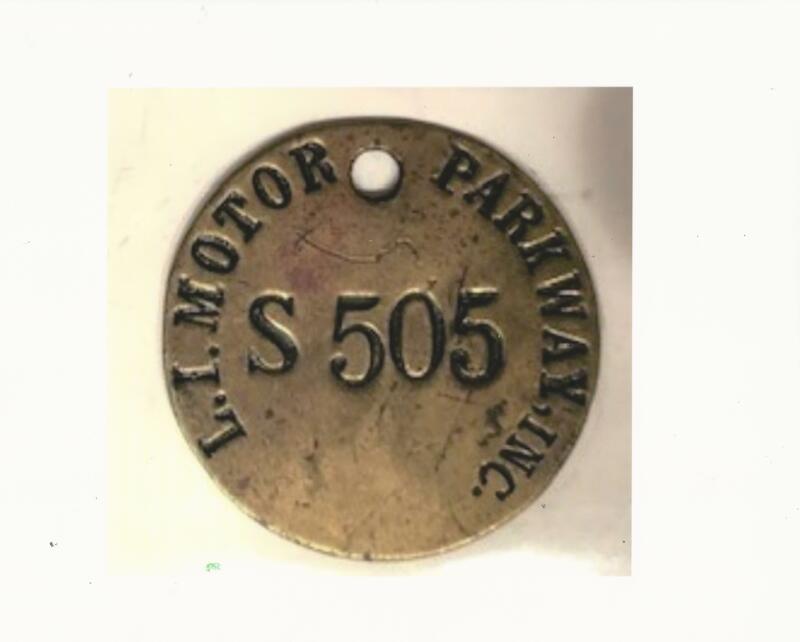 As described in our book The Long Island Motor Parkway, this was a paycheck, made of brass (one and half inches in diameter) issue to Motor Parkway construction workers. How was it used? Why is there a hole in the object? Al Velocci: I acquired tthis tage in the early 1990's from a surveyor whose firm had taken over a similar company. He found it in a file marked Motor Parkway. He did some research and discovered the Parkway borrowed a page from machine shops that used similar tags to keep track of borrowed tools. During construction, the Parkway hired hundreds of Italian laborers but they were not actually Parkway employees. Instead, the Parkway used what was known as the "Padrone" system where companies would not only supply the laborers but also a level of oversight since most of the workers did not understand or speak English. When reporting for work in the morning the laborers were issued the tags which most of them wore around their necks. The tag I acquired I was told had a leather strap attached to it at one time. This way foremen and others knew who was where and who was doing what. At the end of the workday (ten hours) the tags were turned in , the process repeated the next day. The majority of the laborers were supplied by the Panza, Russo Company located at 73 Park St. in the City. In December 1908, a Carlo Triola who had lost his tag, hired the Protective Italo-American Company whose office was located in the Bowery Bank on Grand Street in little Italy, to recover three days pay he said was owed to him by the Parkway. I know of only one other similar tag, hope this mystery photo turns up others. Congrats and kudos to Francis Clax, Art Kleiner and Brian McCarthy for recognizing this tag used to identify Motor Parkway construction workers. Motor Parkway workers on pay day. Source: Clinton Robertson Photo Album. 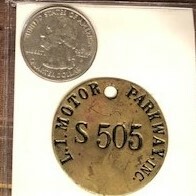 Is this an early Motor Parkway key ring fob, possessing immediate access onto the Motor Parkway, not requiring a parkway plate nor mundane ticket purchase? This would be an awesome revelation I’ve never seen before. I have no clue at this point. Waiting impatiently for the answers. I collect defunct automotive marque tool check tags and that is a mighty fine and unique one. The purpose of such items were to associate a particular worker/employee with a particular company tool loaned to them for performing a manufacturing or maintenance job. The center hole was used to place the tool check on a peg (though more usually a hook) on a wallboard as the indicator of which employee by assigned number borrowed the tool. Very nice L. I. Parkway artifact. A Parkway paycheck made of brass. Issued to Motor Parkway construction workers and used insted of time cards. Would suppose the hole was to keep it attached to the worker during the day. Forget to thank Al and Howard for including this in their LIMP book. Initially, I figured this was a ID tag for a employee of the parkway. Attach it to a key chain etc and display it upon demand. I then witnessed this item within a LIMP History Book describing it as a ‘Parkway paycheck issued to each field worker, using this as their timecard’. My imagined scenario: A worker would hang their paycheck on one of many hooks in a office at the start time and retrieve it at the days end. Trying to not misplace it and needing to display it on pay day. Hi Howard, Thought the respondents to the mystery photo would like to know more about the tag. I acquired it in the early 1990’s from a surveyor whose firm had taken over a similar company . He found it in a file marked Motor Parkway. He did some research and discovered the Parkway borrowed a page from machine shops that used similar tags to keep track of borrowed tools. During construction, the Parkway hired hundreds of Italian laborers but they were not actually Parkway employees. Instead, the Parkway used what was known as the “Padrone” system where companies would not only supply the laborers but also a level of oversight since most of the workers did not understand or speak English.. When reporting for work in the morning the laborers were issued the tags which most of them wore around their necks. The tag I acquired I was told had a leather strap attached to it at one time. This way foremen and others knew who was where and who was doing what. At the end of the workday (ten hours) the tags were turned in , the process repeated the next day. The majority of the laborers were supplied by the Panza, Russo Company located at 73 Park St. in the City. In December 1908 a Carlo Triola who had lost his tag, hired the Protective Italo-American Company whose office was located in the Bowery Bank on Grand Street in little Italy, to recover three days pay he said was owed to him by the Parkway. I know of only one other similar tag, hope this mystery photo turns up others. Carlo Triola Lost his tag December 1908. It shouldn’t be too hard to figure approximately what section of the motor Parkway was being constructed at that time. Let’s get out there with metal detectors. I know silver holds up perfectly to the elements of nature, how does brass hold up? Carlo’s 110 year old brass tag lost under dirt moisture will patina (turn light blue) at best, serving as a protective layer, but its alloy - zinc, copper, or tin will corrode under moisture and can weaken it to soft brass. Brass alone however does not rust. Imagine how important the paymaster’s job was. I’m sure the workers were paid in cash. 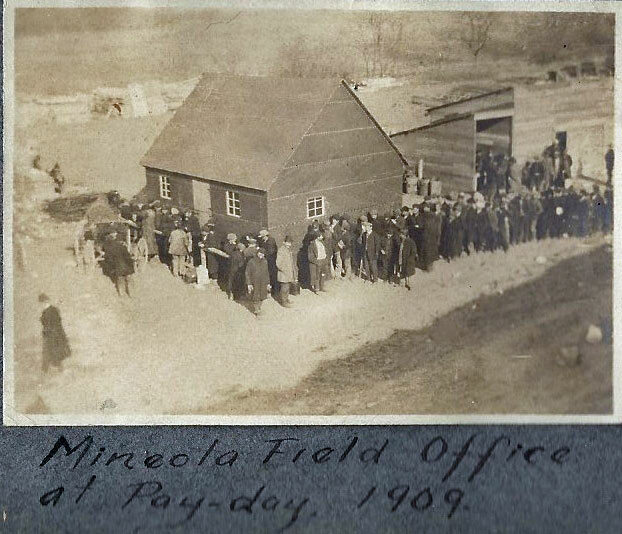 Maybe the paymaster went to the Bank Of Mineola (just speculation it would be a local bank). to make a payroll account withdrawal the morning of payday. Well in 1909 the only withholding would have been for worker related expenses if there where any ( company brought lunch to the site?). Wouldn’t be great if somewhere a payroll accounting record still exists. That’s why history is a never ending revelation. Howard,Al et. al. are all great. Love to meet you someday and just talk for hours. Just reading about these items is endlessly interesting,and each event raises more questions. For example, how did these workers get to the site? Maybe they rode he trolleys from their neighborhoods in Williamsburg or Ridgewood to Jamaica and then transferring to trolleys out to Mineola. To answer some of John’s questions, the laborers were provided with sleeping accommodations paying 50 cents a week in dormitory like buildings that were built on skid like platforms and were moved as construction proceeded. They only went home, mostly to Brooklyn and Manhattan, on late Saturday by railroad looking forward to a very hot shower and heaping plates of pasta returning early Monday morning. Many of the laborers brought food back with them, mostly consisting of cheeses, sausage like meats, bread and fruit. You can imagine what the those dorms smelled like. Local farmers and teamsters, knowing the drill, would show up with work wagons and take them to and from the nearest railroad station. Merchants would come out to this moving army also provided hot coffee, sandwiches etc. One could also buy clothing including work shoes. 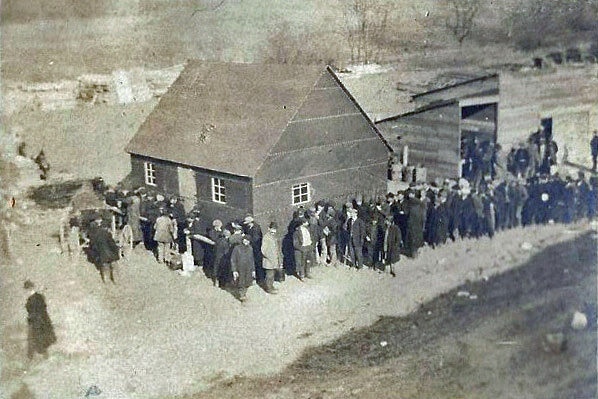 Merchants offering alcoholic beverages were not permitted on the job sites. When in season nearby farmers would come around selling fruit, berries were especially popular. Regarding payroll records, most still exist at the Vanderbilt Museum in Centerport. This seemed to be commonly used pre-WW II. I don’t have any for the Parkway, but have 2 from Lakehurst to identify/pay the landing crews handling the big rigids. The question remains where might the many other tags be or did they get repurposed for either of the major war efforts? It is most likely that most others were recycled for their brass when the government requested. Al stated that he knew of only one other, which is not uncommon for such item/artifacts. Very neat find! Thanks again Al. As Al explained, the ‘paychecks’ had a twofold purpose. Unless their foreman were fluent in English & Italian, the tags acted as identification. Yes, eventually everyone will know each other besides having the tag. After what occurred with Carlo Triola, misplacing one’s tag does cause pay issues. And he needed to retain The Protective Company to recover his lost wages. This ‘paycheck’ was a crucial item to the laborers.